What Does Big Data Mean For Your Business? What is “big data”? To understand how it can be useful to your business you need to know the meaning of this expression. Every organization in its operation generates information – documents, insights, knowledge, etc. Each year, the increasing amount of companies enter local and global markets. Thus, the quantity of the stored and processed data gradually rises. 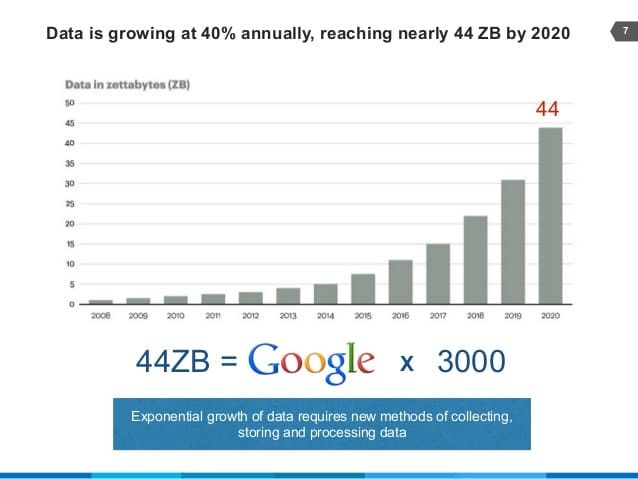 Aureus Analytics predicts that by 2020 the total volume of such information will exceed 44 zettabytes (44 sextillion bytes). Currently, this figure is around 15 zettabytes. If we wrote all this info to DVDs, it would make a pillar 2.5 million miles long! Which is more than ten times the distance from the Earth to the Moon, by the way. The term “big data” is used to define such massive volumes of information that common programs inevitably fail to try to handle. Same goes for the hardware – the typical office PCs have no capabilities to store and process big data. To solve this problem cloud technology is used, which provides the highest possible bandwidth communication channels, storages, and computing power. A “cloud” is an Internet-based service that offers its customers a uniform environment for extensive storage and computational capacities. Users interact with a cloud through a convenient interface without the need to bother about technical details. The underlying hardware, operating software, failsafe and security measures, and maintenance staff can be allocated in one or several supercomputer centers across the globe. “Big data” is also used to refer to flexible tools, methods, and approaches designed to collect and store the abovementioned amounts of info. Such information can be ordered or chaotic and is assembled from different sources, mainly social media. The main tasks of big data technologies lie in accumulating, sorting and processing of the constantly incoming enormous volumes of information for further analysis and trends searching. Big data analytics helps organizations harness their data and use it to identify new opportunities. That, in turn, leads to smarter business moves, more efficient operations, higher profits, and happier customers. Instead of creating and upholding own datacenter, the company can order the creation of big data analysis service hosted in the cloud at a notably lower price. An experienced outsource service vendors propose even the cloud migration of the existing server infrastructures, augmenting them with big data analytics in the transfer process. According to IBM scientists, about 90% of all Big Data existing today was generated in the last two years. Thus, it turns out that due to the new information appearing all the time, big data technologies will sooner or later be in demand in all spheres of human activity. Already, systems and methods for processing large amounts of data using cloud technologies are implemented in medicine (for example, statistics on Google’s search engine inquiries about a particular disease help to calculate the scale of epidemics), education and, of course, in business. Big Data in Business: What Advantages Can New Technologies Bring? The first thing that comes to mind when mentioning big data in business is a universal alternative to modern automated business process management service. Indeed, large enterprises generate high volumes of constantly replenishing internal information (procurement, trade, logistics, human resources and much more), though this by no means is the only sphere of the big data technologies application. The success of any business depends on strategic decisions. The most correct, as we know, are those decisions that are based on deep and wide analytics. And the more data is analyzed before making a decision, the more accurate and successful the solution will be. Thus, big data technologies are of major importance here. There is even a class of software services, such as 1000Minds, D-Sight, DecideIT, Expert Choice and others, that automate the process of making the routine daily decisions in business. The main sources for the collection of big data are social networks. Studies of social media collectives, such as Johan Bollen’s “Twitter mood predicts the stock market”, show that nowadays social networks can significantly and directly affect the market trends (in particular, the Dow Jones index). This means that a well-designed algorithm for social networks monitoring can be very beneficial. Predicting the market trends in advance, you can adjust your business strategy on the fly. Among other things, Big Data includes the personal data of users, collected from various sources, purchased from data exchanges, and provided by the users themselves. The task of the company’s marketers is to use the received data to personalize communication with the client, create relevant content and improve the overall user experience. The automated analysis of the accumulated client data helps to reveal tendencies, interests, and problems in communication with customers. With the ability to gauge customer needs and satisfaction through analytics comes the power to give customers what they want. Today we in IT Svit can confidently say that Big Data technologies are not just new methods of data processing and sorting, it’s a new trend that appeared in response to the demand for the analysis of the vast volumes of information. Big data technologies are already applicable (and successfully applied) in many areas of human activity, including business. This is the future. And those who first master new methods and tools are bound to success. NextAnsible, AWS CLI & Kubectl in docker container Previous Can the blockchain change the world?